Ed Smith was born in Naples, Italy and raised on Cape Cod, Massachusetts. He received a BFA from the University of Massachusetts at Amherst and an MFA from City University of New York–Brooklyn College. After living and working in New York City for 10 years, Smith moved to south Louisiana where he became fascinated with the landscape, fauna and John James Audubon. 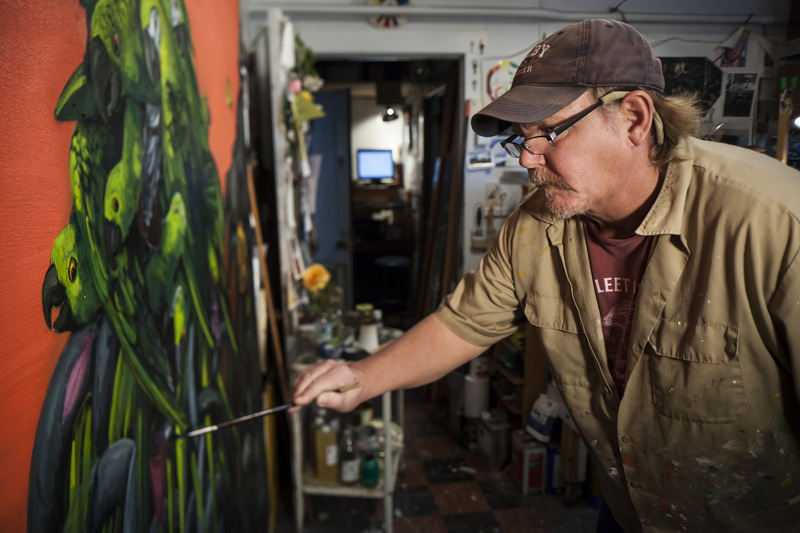 Smith is currently a professor of painting at Louisiana State University in Baton Rouge. He divides his time between Louisiana and Maine. Ed Smith’s paintings captivate with their lush depiction of an apocalyptic or post-apocalyptic world. Or perhaps it’s just now. On his canvases birds hold their ground resolutely—despite their precarious perches in an environment gone colorfully wrong. Acid rain, acid clouds, acid sunsets provide cold comfort. Acutely aware of their dilemma, the birds glare at the sky, at each other, at the viewer, implicating us in their plight. Though these images evidence a naturalist’s eye, Smith is working his own angles on the man-made natural landscape of the 21st century. The birds of America are no longer the source of easy reveries, but in their mute survival they remain objects of wonder.